One of our best selling collections the Rustic oak range has been a trend that has stood the test of time well, full of character, with a robust look, solid construction and unfussy design, this is a range that will suit every home. 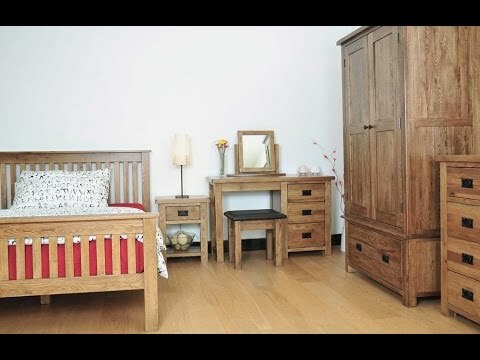 There is a no nonsense approach with this range with solid oak used in it's construction and deploying the techniques used by generations of cabinet makers to bring you the very best quality. Featuring solid mortise and tenon joints throughout the solid wood frame and where there are drawers these have dovetailed joints and solid tongue and grooved bases - this t&g also features throughout the ranges cabinet backs too. Metal drop handles on all drawers and a single metal knob style handle on all doors with matching black hinges. The design is topped off with a gorgeous matt lacquered finish which is not just very durable and low maintenance, but also enhances the grain and really shows off the natural characteristics of the oak. The look is further enhanced by the rounded corners and a little rustic detailing added into some of the edges of the tops. As always you are more than welcome to collect (please do call 0800 1223334 for availability) but if you prefer delivery can be arranged by an experienced team of two, who will unwrap and remove all packaging - this coffee table does come fully assembled.